When Family Support is a Super-Power! While weight loss tops most New Year’s resolutions, one Richmond-area family of five is kicking off 2018 with an incredible head start: They’ve already lost a combined total of 398 pounds. “We’ve lost [the equivalent of] a whole person, as each one of us used to weigh almost that much,” says Vern Phelps, a Prince George County employee who shed 152 pounds by following the same low-carb, high-fat eating program as his wife, Cathy Phelps, who lost sixty-eight pounds. Cathy’s father, Hassel Woosley Jr., the first in the family to enroll in the VCU Medical Weight Loss Clinic, dropped eighty-three pounds. His wife, Carol Woosley, lost thirty pounds and their daughter, Sharon Woosley, is sixty-five pounds lighter. 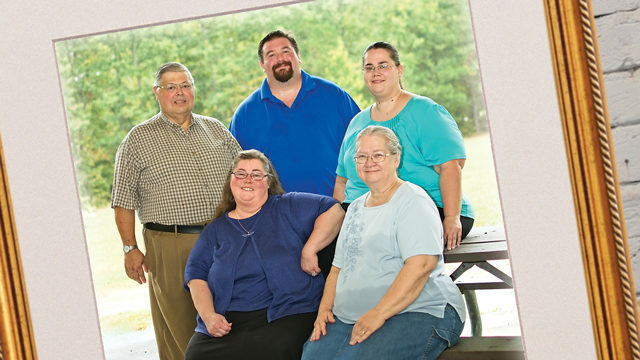 For this family, modifying meals – specifically avoiding sugar and limiting the amount of carbs consumed daily – not only melted pounds, but also improved their health and ability to concentrate and boosted their energy levels. “I feel more energetic, and that surprises me,” says Hassel, who weighed 388 pounds when he first met Susan Wolver, MD, medical director of the clinic at VCU Health’s Ambulatory Care Center in Richmond. “I’m not as stressed as I was before. It’s been a super improvement. I’m not planning on ever coming off the program,” says the Chesterfield County resident who stopped taking insulin last summer (2017) after eight months in the clinic. “My AC1 is the lowest it’s been since 2004,” he says. Other rewards of their new eating lifestyle include grocery bills cut in half as cravings and appetites have decreased, family members say. Participants in the VCU clinic can indulge in healthy, natural fats such as butter, olive oil, and avocados, and consume non-starchy vegetables and meats, including bacon, among other foods. And to top it off, there’s no calorie counting. Eventually, portions of nuts, fruits, and other foods are added back. The weight loss clinic, which currently has a year-long waiting list, includes lifestyle coaching and a supportive online community. For the initial weight loss class, Dr. Wolver invites participants to bring a supportive person with them. Often that person is a family member – one reason why entire families are becoming big losers in the weight department. “I prefer a family member who lives at home to attend, because when the patient comes home and says, ‘the doctor says to eat bacon and eggs for breakfast,’ other people don’t always believe them, and also, it’s so important for the person at home to support someone trying to lose weight by keeping the foods they can’t eat out of the house or under lock and key. I think that when people do this together, it’s so much more effective,” says Dr. Wolver, an associate professor and internal medicine and obesity medicine specialist. Sharon and Vern are not formally in the clinic, but they eat the same way as Cathy, Carol, and Hassel, who joined during the winter of 2016. Sharon plans to enroll in the clinic as soon as she gets a coveted appointment. Vern says he wants to officially enroll, but a hectic work schedule will likely prevent him. The weight loss successes of the Phelps and Woosleys are part of what Dr. Wolver calls the “sphere of influence” that occurs in dozens of families after one member joins the program, which over 1,500 people have started since May 21, 2013. “If you look at almost every single one of my patients, you can see a sphere around them of people they have influenced,” Dr. Wolver says. Dr. Wolver counsels Dana Williams – one of her patients, who also happens to be a nurse at VCU Health. After her father joined the clinic, Sharon and her mom Carol decided to follow his new eating plan. It didn’t take long for changes to occur. “We all noticed we felt better and could think more clearly. And emotionally, you don’t feel as bogged down,” says Sharon, a baker who has adapted the low-carb, high-fat approach to her cookies and cakes. Her keto brownies, keto coconut cookies, and keto strawberry shortcake (named for the program’s ketogenic diet) are popular items at the Farmer’s Market in Amelia County. According to Cathy, changing the menu at home and when eating out is crucial. For example, this past Thanksgiving differed from previous ones since stuffing and corn pudding were off limits for everyone but her grandfather and nephew. The biggest challenge was the day after Thanksgiving when she and Vern ate at his parents’ home. They ate a bite of dishes they don’t usually eat so they could say the food was good. “It was like what Dr. Wolver said, ‘let your next bite be on plan,’” said Vern. There isn’t one secret sauce for the success of the clinic, says Dr. Wolver, but finding a way of eating that causes people to be full and satisfied is a game changer. How does the doctor measure success? “That’s a very difficult question. Weight loss programs are notoriously high in dropout rates. 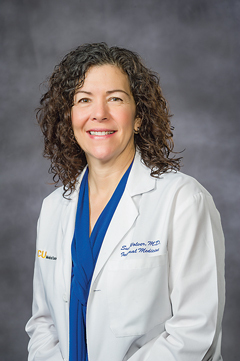 We did a little study of just over one hundred patients, and we found people who stayed in the program for three months had really significant weight losses and kept it off for over eighteen months,” Dr. Wolver says. According to Dr. Wolver, patients who continue with the program have at least significantly reduced their insulin usage and most have completely stopped. This includes patients who were taking hundreds of units of insulin and some who have been on it for 30-plus years. In the hallway outside the examining rooms where Dr. Wolver monitors the progress of clinic patients, hundreds of photos of women and men are displayed. They’re wearing proud grins while holding several bright red physicians’ reference books that weigh eight pounds each. None of the photos could be posted until each person had lost at least twenty-four pounds. So many people have lost weight, there is no more space. For the Phelps and Woosley families, their shrinking physiques and positive attitudes attract attention, compliments, and questions. “For all of us, this is a lifestyle change. People ask me, ‘What are you doing?’ and now they want the information,” says Vern. “Dr. Wolver needs to start something like Wolver Weight Loss Clinics,” he says, chuckling. As the pounds disappear, so too, do weight-related health issues. Cathy’s triglycerides have dropped from over 1,500 to 500, and Vern’s cholesterol level has never been better.